And that means warmer weather, flip flops, and enjoying a cool treat on a stick. But warmer weather also means, swimsuit season is near and it’s time to snack a little healthier. 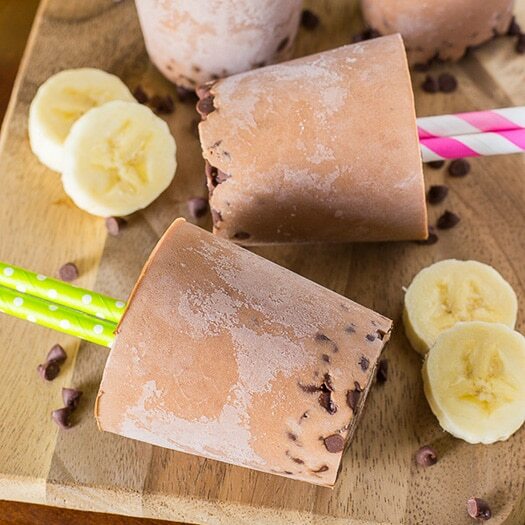 These super easy to make Chocolate Peanut Butter Banana Smoothie Pops are the perfect snack or on-the-go breakfast that are packed with everything you love about a smoothie in these fun, frozen treats on a stick and are perfect for the warmer weather ahead! ✔ These smoothie pops take a little bit of planning ahead to make sure that they have enough time to freeze before your are planning on enjoying them. I like to make the smoothie pops the night before and leave them in the freezer overnight, which gives them plenty of time to freeze and be ready to enjoy for breakfast! ✔ I used 3 0z. paper cups to make these smoothies but you can use any fun popsicle molds that you have. I also have a TON of paper straws, so I decided to use paper straws as the “sticks” for these smoothie pops, you can also use regular wooden popsicle sticks. ★ If you do use paper straws, make sure that you use two paper straws for each popsicle, this makes them sturdy. 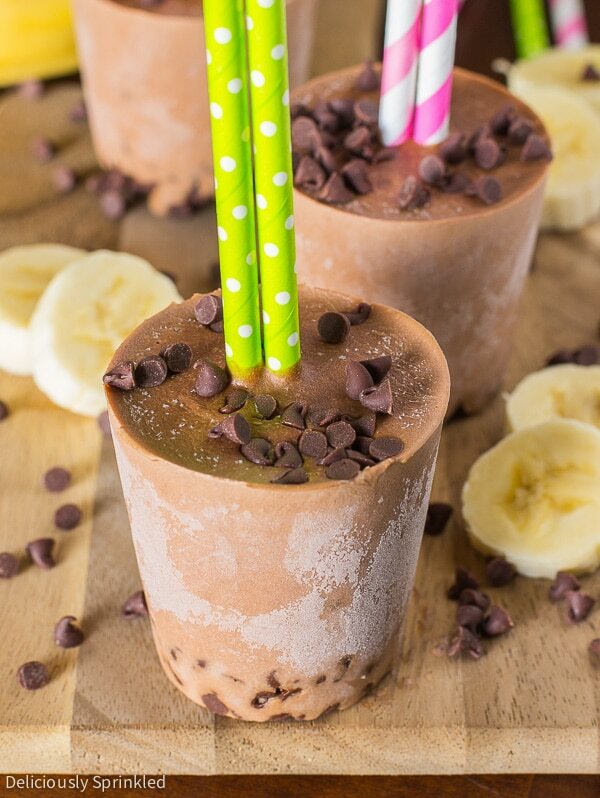 ✔ I highly recommend that you use overly ripe bananas because they have just enough sweetness to really bring out the delicious banana flavor in these smoothie pops. 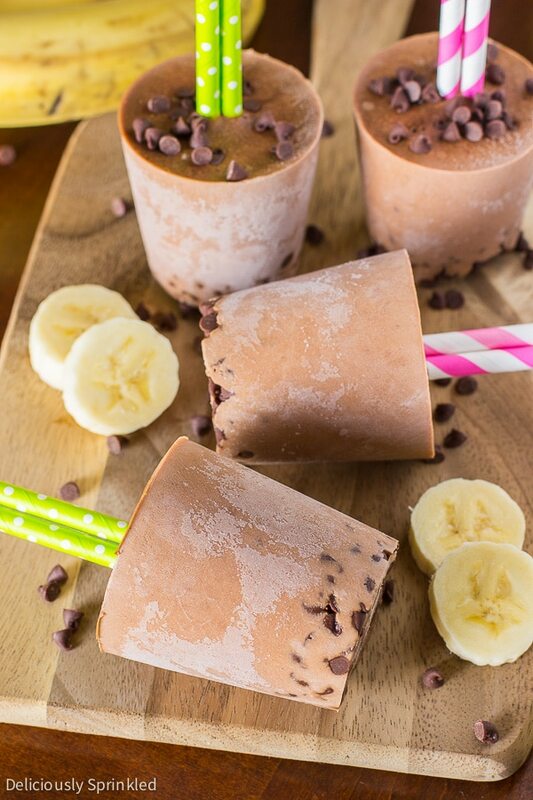 If you use a ugly, brown bananas then these smoothie pops won’t taste as good and no one likes brown bananas. STEP 1: Add the milk, vanilla yogurt, peanut butter, cocoa powder, and vanilla extract to blender. Blend until smooth & creamy. STEP 2: Place 6 paper cups onto a small baking sheet. 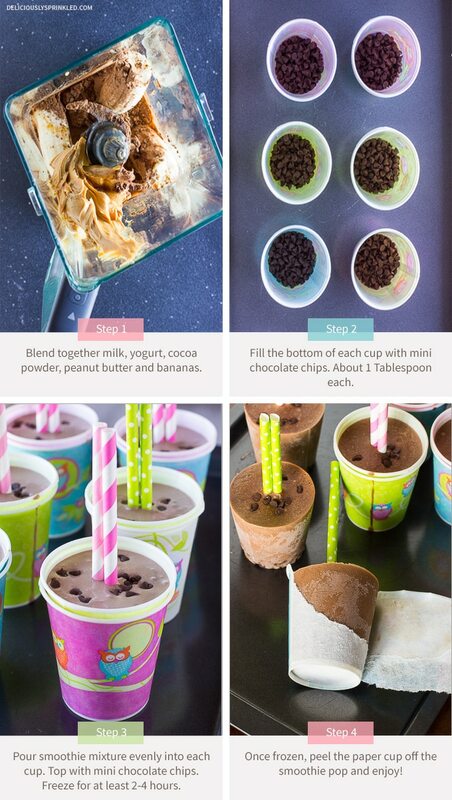 Fill bottom of each cup with 1 Tablespoon of mini chocolate chips. STEP 3: Pour smoothie mixture evenly into each cup. Sprinkle top of smoothie with a couple additional mini chocolate chips. Place in smoothie pops in freezer for at least 2-4 hours before serving. You will need a good blender…I love my Ninja blender! 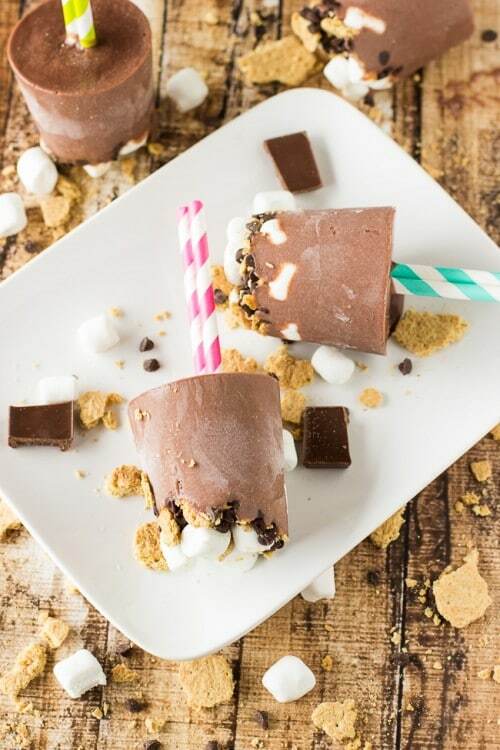 And try these S’mores Fudge Pops next! This is a sponsored post in partnership with REAL® Seal. I’m thrilled to be partnering with them as a REAL® Seal Dairy Diva to share some of my favorite baking recipes. All opinions are my own as always. Thanks for supporting the brands that help make Deliciously Sprinkled possible! Chocolate and Peanut Butter are my favorite and this healthy treat looks great for the summer! Jenn, these are SO cute! I definitely need to make some this summer! Wow! These look healthy and delicious. I love peanut butter and chocolate. The additional banana really makes these a triple threat.